On March 24, 2013, a woman was found floating lifeless in the water of Myrtle Beach, S.C.
Lifeguards called to the scene pulled the victim on shore and performed CPR, but a short time later, the woman was pronounced dead at Grand Strand Medical Center. 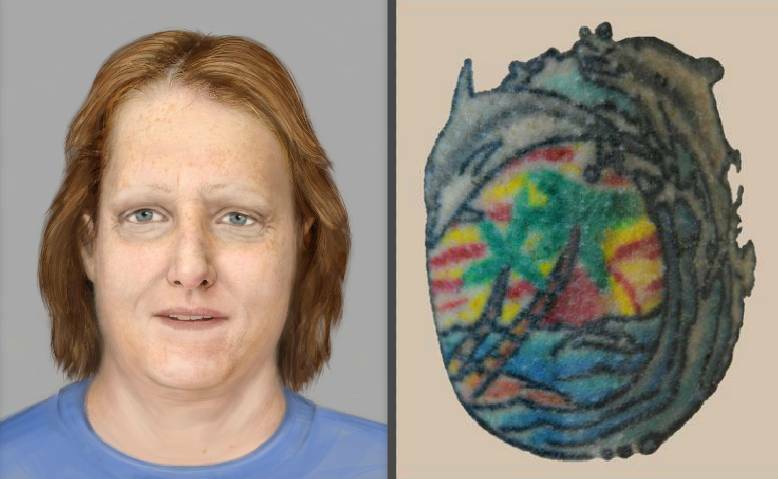 The woman remains unidentified. The Myrtle Beach Police Dept. released a statement describing the deceased as a Caucasian female in her late 40’s to mid-to-late 50’s. Her height is approximately 5’3″ to 5’6″, and she weighs between 170 pounds to 185 pounds. The woman has reddish/blond hair. She had a colorful bright tattoo just above her left ankle depicting two dolphins jumping out of the ocean in front of the sun. The tattoo is oval shaped about 3″ in circumference. She was wearing a floral print bathing suit top, gray shorts, and a t-shirt with the words “Sail fast—live slow” screened on the front and back along with “Beaufort, NC.” These pieces of evidence would help guide the investigation at first, but never led to the answers needed to close the case. the Myrtle Beach Police Department at 843-918-1382.